They are small enough to fit in my small dog's mouth. They fit perfectly in my Furbo dog camera! They are heart-shaped. Check out my post about Bebe and Jolie's most favorite food you'll understand the fascination. They are chewy and moist, perfect for any dog and especially toothless senior ones like mine! They are good for your pup! Formulated with omega-3 and 6 fatty acids for skin and coat health. So this month when Chewy.com offered it in their influencer option I was delighted to snag a bag, as I am already a fan of these yummy treats. You know the saying "you can't teach an old dog new tricks" well, that's simply not true! I'm going to share some different ways you can entertain your dog with treats! And also, my oldest was about 7 years old when I taught her how to *sneeze* and *speak*, proof that you can indeed teach an old dog new tricks! I picked up this cute and small dog toy at T.J.Maxx for just under $4. It's a small wooden plaque with little pieces that look like chess pieces. They have holes in them so that the treat scent will be available for your pets to know there's goodness hiding underneath. You hide the treats under each little piece and allow your pet to either lift up the piece with their mouth or knock them over with their snouts. Either way it causes them to work for their treats and figure out how to get the treat out. When I first got this toy, my dogs had no idea how to get to the treat, they would just stare at it and bark. Now they enjoy playing with it and grabbing the treats from underneath. If you want to DIY you can use mini/regular sized cupcake pans and place the treats under some tennis balls. Your dog will have to lift the ball to get the treat. If you don't have all that lying around, you can find some interactive toys here. As a fur momma of two senior pups, I have noticed that my dogs are not as sharp as they once were. Many dogs, as they age, lose some visual acuity and their hearing dims but thankfully, their ability to smell remains strong. Using that sense of smell to play scenting games is something that dogs can do long into old age. Take your treats and hide them around the house, my dogs know what the words, bathtub, door, bed, and sofa mean. Exercise their minds and tell them to go look for a treat by the bed, or the door. It's really quite fun watching them search for the treat. Whether I'm at a dog park or at a friends house for a doggie play date, I always like to keep a crinkly bag alongside me filled with treats. As you may know, dogs get very excited over the sound of treat bags, bags of chips, or plastic. When I expose my dogs to a social situation I like reminding them that I've got the goods and make a sound from my pocket. I will proceed to ask them to sit, stay, or be a good girl if they get too rowdy. This works 90% of the time, teaches them discipline, and they are being rewarded for good behavior! Dogs, just like humans need exercise. It's good for them to get up and out and stretch their legs. It keeps them healthy, happy and helps with food digestion. I live in an apartment and so there isn't too much room to do this with my pets. Luckily my dogs are small and so not too much is needed to get them tired. Take your treats and place them in places where they can see. Top of the stairs, top of the bed, under the table, and scream GO! Run alongside your dog to help her see where the treat is and do it fast, like a human and dog agility course. Careful how quick you do it, I've knocked over some vases, and broken a few things while doing this. I wasn't' terribly upset because my dogs love this game! I don't know where you live in the world, but we live in Arizona. It gets pretty hot here. Take some of your treats and fill up an ice cube tray with yummy fluids filled with electrolytes or vitamins. I personally love this one, putting a treat inside the ice cube keeps them busy for hours, and hydrated! They won't even know that playtime is good for them! The most important thing is to treat your dogs with love and shower them with affection and attention. They are around for such a short while, spend time with them when you can, rewards them for good behavior and feed them the best treats while doing so! The "it's time for a dental cleaning" look. If you've been following me for a while, you'll know I post a lot about dental decay, dog gingivitis, and oral health. 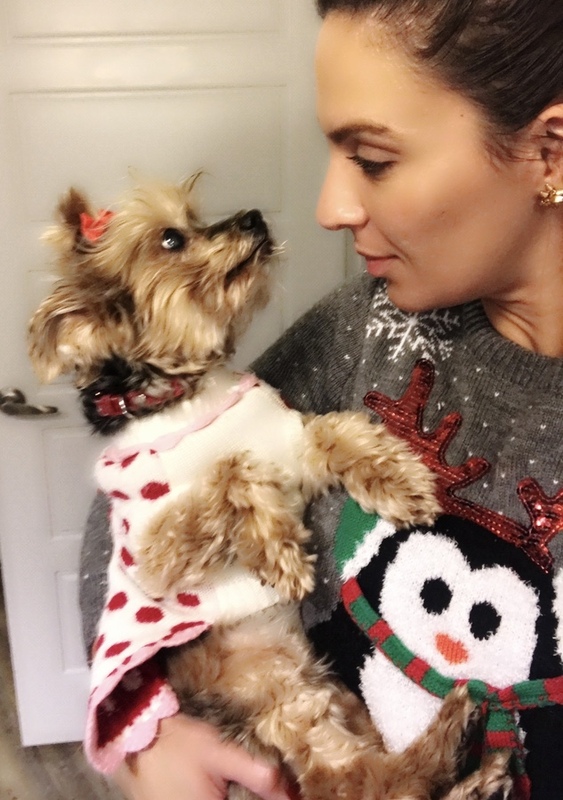 The reason for that is because I am the proud fur mom to two senior Yorkies. Yorkies are notorious for being many things such as intelligent, hypo-allergenic, and downright adorable, but they are also known as one of the top ten breeds that is prone to dental disease. Periodontitis disease and gingivitis is a very serious thing that can cause serious issues for your pup, including death. Seven years ago I shared an article on dog gingivitis and how my oldest Bebe had already started to lose teeth. You can find that article here. 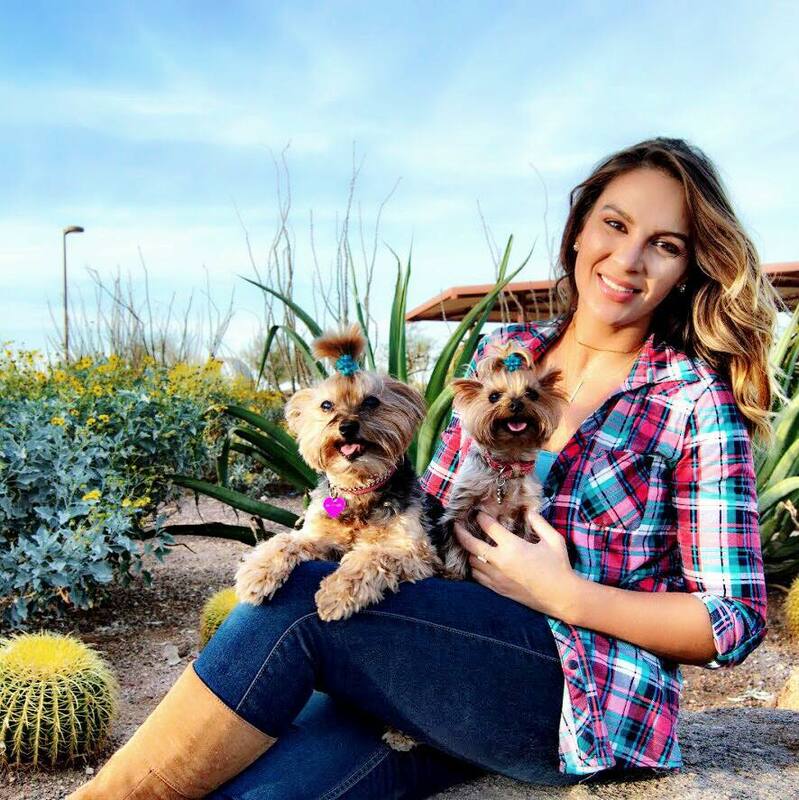 Three years ago after giving my dogs a bath and a foul-smelling tooth fell out of my dogs mouth I quickly scheduled an emergency cleaning and ended up spending several hundreds of dollars, I had my dog's teeth cleaned, scaled, and mostly removed at with Dr. Alex Casuccio at Scottsdale Animal Healthcare. That post really shows the effects of plaque build up. Then sadly, this year I had experienced the most traumatic event a fur mom could never prepare for. My dog almost died during a routine dental tooth cleaning. A dirty needle was administered in her IV and she became paralyzed and bacterial sepsis nearly killed her. As you can imagine we no longer are going the anesthesia route! Last month I found a holistic vet that did anesthesia-free cleanings. The process took 25 minutes but the vet only did my younger one's teeth. The older dog, the one who had almost died earlier in the year was too agitated and didn't want her mouth touched. Below is a photo of Jolie getting her teeth cleaned without anesthesia. The description of the product is what immediately grabbed my attention, "Take the hassle out of cleaning your pup’s teeth". The hassle is putting it lightly, try to envision holding your dog in between your legs and trying to gently pry their mouth to get a toothbrush in there, all while getting the toothpaste everywhere except in their mouth! I was happy to read that this was a powder administered in their food instead of another toothpaste challenge. This powder is a tasty, aromatic powder that’s designed for use between dental cleanings to promote clean teeth, fresh breath and oral health. The instructions state to simply sprinkle Perio over your pup's meals, and allow this pawsome supplement to help prevent tartar buildup and plaque formation by working organically to eradicate bacteria. Perio Support contains natural zeolites that may help prevent plaque from forming and the cranberry powder helps to support gum tissue health, and probiotics to help displace plaque-building bacteria. their breath has gotten better, more kisses for mom and from mom! Bebe's tartar has become easier to clean off after using this product! Being that Bebe only has about five teeth left I believe that the percentages of tartar and plaque removal are definitely in her favor. I am excited to see the results after a full four weeks and will post an update here when that time comes. This product also comes highly recommended by vets and so I do trust that the results will be positive!